While it may be hard today to imagine the shopping center at the intersection of Arlington’s Glebe Rd. and Wilson Blvd. as an exciting and advanced piece of architectural planning, it truly was at its opening in 1951. At the time, it was the largest suburban retail space on the East Coast, and the first ever to be built around a parking garage (which also happened to be the largest parking garage in the United States). This sort of retail design was an absolute novelty, and an early hallmark of both the post-War evolution of the American suburb, as well as the DC area’s growing population. Its name, however, was a little on the nose: Parkington. As a result of the newly “changing picture”, the question of precisely what a shopping mall was supposed to be was learned by trial and error. Hence, some of the stranger moments in Parkington’s early history. For example, while the “department store Santa” had been an established phenomenon for several decades, the “department store chimp” was a different story. On more than one occasion in the 1950’s, Parkington Shopping Center was graced by the presence of beloved television star (and chimpanzee) Zippy the Chimp], who earned his fame on the Howdy Doody Show as well as the Ed Sullivan show, where he roller-skated across the stage. One can only hope he gave the same performance in Ballston. During its golden years, which lasted for roughly two decades, Parkington was a destination for shoppers from all over the region. In 1959 alone, it accrued $223 million (~$1.9 billion in 2017) in retail trade, with 24% of business involving visitors from Maryland and Washington. By 1970, the shopping center boasted thirty stores. Thus, Parkington fell deeper and deeper into irrelevance. 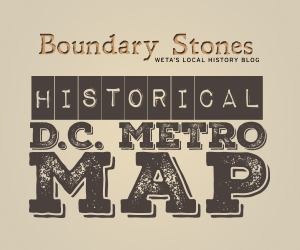 However, in 1979, the mall was provided with the vitalizing opportunity it needed: Ballston’s Orange Line Metro stop, which would serve as the terminus until 1986. With the Metro came talks of renovation and redevelopment, providing a breath of fresh air to a mall steadily heading towards failure. With a hard-fought $13 million ($43.8 million in 2017) investment from Arlington County, plans were set in motion to completely overhaul Parkington. In 1982, the county board approved the renovation, with a reopening planned for 1984 under the new name of Ballston Common Mall, a name chosen via a local contest.The redevelopment was not without its problems. Only four months after its approval, issues of “architectural complexity” as well as problems with the IRS had already pushed back the mall’s reopening to 1985 (which was then later pushed to 1986). In 1983, the Oliver Carr Corporation, one of the area’s largest developers, pulled out of the plan. Still, the mall’s future was exciting. Ballston Common would feature four stories and more than 100 businesses (including two new anchors), as well as nine stories above the mall for office space. Of course, the very same facilities praised in 1986 would be similarly derided in 2016. Nevertheless, for the next two decades Ballston Common remained respectable, if not still slightly humble. The neighborhoods around the mall continued in the march towards urbanization as new high-rise developments were put up to match the revamped vibe of Ballston Common, further spurred on by the Metro. Yet, just like Parkington before it, Ballston Common eventually had its own decline. Though notably chosen as the site for the Washington Capitals’ practice arena in 2006, Ballston, like many shopping malls across the country, suffered in the digital age. When the enthusiasm brought on by redesign faded, Ballston Common fell into many of the same traps as Parkington, namely dingy infrastructure and lackluster retail options. By 2014, Ballston Common had earned much the same reputation that Parkington had in 1979, and like in 1979, developers decided it was time for a change. In 2015, plans were approved to turn the mall “inside out”, updating it again to match the needs and expectations of a new generation of shoppers. Thus, the tradition of retail birth, death, and rebirth continues on at Ballston. One wonders what shoppers will think of this latest iteration in another 30 years. ^ Eno Transportation Foundation, "Parkington Shopping Center Design," Transportation Quarterly (1952, vol. 6, no. 4, pp. 440–456.). ^ “Parkington Shopping Center”, BBC and USIA. ^ “See Zippy the Chimp at the Hecht Co.” The Evening Star. Nov, 14 1955. ^ “Northern Virginia Tour Impresses State Lawmakers” The Evening Star. Jan 24, 1960. ^ Scannell, Nancy. “Center Renewal: Parkington”. The Washington Post. Feb 25, 1982. ^ O’Neil, Alison. “New Paint, More Space for Area Malls”. The Washington Post. Oct 18, 1982. ^ “’Complexity’ Delays Ballston Project”. The Washington Post. Oct 1, 1982. ^ Bohlen, Celestine. “$100 Million Development Set for Ballston”. The Washington Post. May 19, 1982. ^ Mayer, Caroline. “Ballston Common is Arlington’s Uncommon Showcase Mall”. The Washington Post. Oct 20, 1986. ^ Evans, Sandra. “Arlington Grows Up and Up”. The Washington Post. April 25, 1998. ^ O’Connell, Jonathan. “Developer’s Plan: Turn Ballston Inside Out Mall”. The Washington Post. Jul 24, 2014. In one of the scariest episodes in D.C. history, a deranged shotgun stalker held two city neighborhoods hostage for almost two months in 1993. Washingtonians woke up to a quilt blanketing the National Mall on October 11, 1987, but the atmosphere in the District was far from warm and fuzzy.